Looking for a quick project? 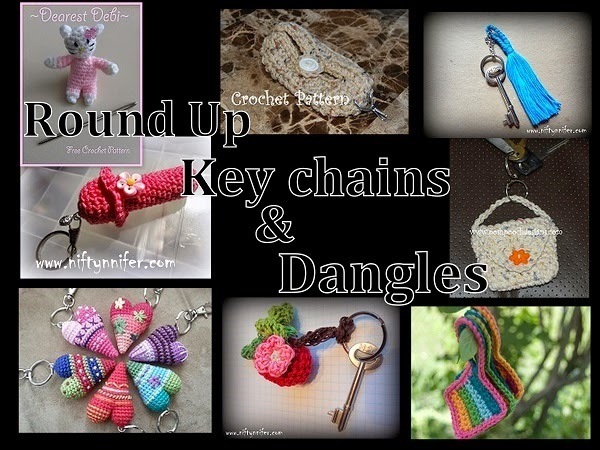 I absolutely love this collection of wonderful key chains & dangles. Add them to your key chain, back pack, zippers & much more! Just click the pattern name beside it's photo to find each pattern. Key Chain Bag ~Crochet Pattern by Sara Sach from Posh Pooch Designs. Here is a fantastic little purse. What a cute place to leave a little note for your loved one. Chap Stick/Lip Balm Holder ~Crochet Pattern by Jennifer Gregory from Niftynnifer's Crochet & Crafts. This handy little dangle opens up to hide your trusty chap stick so you won't lose it anymore! Tag It ~Crochet Pattern by Tamara Kelly from Moogly. Why not work up a matching set of these? They are simply fantastic! 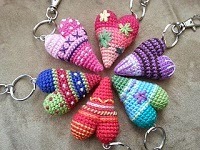 Easy Key Chain Tassel ~Craft by Jennifer Gregory from Niftynnifer's Crochet & Crafts. Not crochet but super easy for anyone. You may never lose your dresser key again! Clip On Poo Bag Keeper ~Crochet Pattern by Sara Sach from Posh Pooch Designs. As a dog owner I know how it feels to forget the poo bag at home. Attach this fantastic bag to your leash and never forget again! This little kitty is sure to make any little girl full of smiles! Crab Apple Dangle ~Crochet Pattern by Jennifer Gregory from Niftynnifer's Crochet & Crafts. Have crab apples on the brain? Me too! Here's one you could make for yourself or a favourite teacher. I love the different use in colour and the fun that radiates off these whimsical hearts.